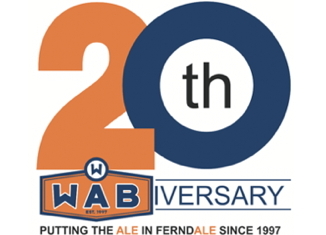 Home Business The WAB : Ferndale’s Unique Brew-Pub Celebrates 20 Years! I recently met with the WAB’s general manager, Michael Pierce, to find out more details on this landmark location. As a notable distinction, the WAB is currently the only brewery/brew-pub in Ferndale; it has retained a comfortable and fun vibe, while serving a good variety of handcrafted brews, and an inviting selection of food. In addition, its popular sister-establishments are within walking distance on Woodward: the Emory and the Loving Touch pool hall/music venue. Along with fellow general manager, Dustin Leslie, Pierce ensures that daily operations in all three establishments are running smoothly. 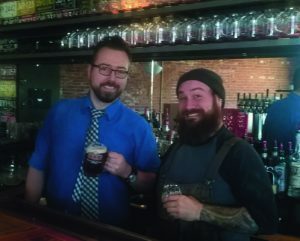 Significantly, the WAB has two relatively new members of staff: Chris Coburn, as brewmaster, and Vince Rossio, as executive chef. Onboard with the WAB crew since January 2016, Coburn’s educational background is in brewing technology and science, plus work experience at Greenbush and Beer Lab London. He creates original recipes, and also collaborates at times with oth-er breweries. One such collaboration with Greenbush Brewery was the ‘Wabracadabra,’ served at the Emory last year). Rossio has essentially revamped the entire WAB menu with very favor-able results; the food served is not at all your typical ‘pub’ food – nothing fried – with an emphasis on healthy items. I had the opportunity to spend time with Coburn, and sample some of his creations. The enthusiasm and knowledge he has for his craft is quite obvious. Chatting with Coburn on the art of making beer is an education in itself! My first tasting was ‘Saratoga’- the House pale ale, a 5.5 per cent ABV brew; it is described by Coburn as having a “light body with a hearty malt flavoring.” Next tasting was ‘Rama’s Arrow Double IPA,’ at a surprising 9.1 per cent ABV. The WAB website description of this IPA is “Smooth, not overly bitter, and maybe a little too easy to drink.” Finally, I tasted ‘Detroit Maiden,’ the House IPA, at 6.8 per cent ABV, described online as “Beautifully balanced with four kinds of malt, Magnum and Cascade hops.” Coburn mentioned that they sell over 30 kegs per month of Detroit Maiden, and they can barely keep up with the demand. All three brews were, in my humble opinion, smooth and delicious. Servers at the WAB have been responding well to Coburn’s lead. Apparently, two of the five main WAB servers have recently taken the Ciserone beer serving certification (at a similar level to Sommelier certification in wine serving). I liked the fact that an option is available for customers who choose to avoid gluten: a guest tap of ‘Starcut Pulsar Cider’; and for those who do not drink alcohol, Coburn keeps a steady supply of quality root beer soda. Keeping in tune with popular demand, an innovative club with-in the WAB was formed in December 2016: “The Brewers Club.” Membership to the club is limited to 97 members, based on the year of the WAB’s launch in 1997. The club has proven to be a hit; at the time of writing, only 20 slots are left. Giving back to the community is important to the WAB owners and management alike. Local fundraisers are organized on a regular basis, such as “Dining for a Cause” and “BarkNation.” Also in formation at the WAB is the “Feel-Good” tap: A craft brew the proceeds of which benefit local, state and national charities in monthly rotation. A special recipe is developed for the brew, which is a year-long process. Overall, it seems the current vibe at the WAB is a mixture of beer-loving tradition, community spirit and progressive attitude; definitely, a winning combination!